The first memorials to the victims of the September 11 attacks in 2001 began to take shape online, as hundreds of webmasters posted their own thoughts, links to the Red Cross and other rescue agencies, photos, and eyewitness accounts. Numerous online September 11 memorials began appearing a few hours after the attacks, although many of these memorials were only temporary. Around the world, U.S. embassies and consulates became makeshift memorials as people came out to pay their respects. 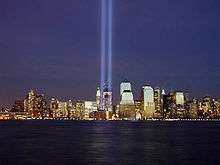 The Tribute in Light was the first major physical memorial at the World Trade Center site. A permanent memorial and museum, the National September 11 Memorial & Museum at the World Trade Center, were built as part of the design for overall site redevelopment. The Memorial consists of two massive pools set within the original footprints of the Twin Towers with 30-foot (9.1 m) waterfalls cascading down their sides. The names of the victims of the attacks are inscribed around the edges of the waterfalls. Other permanent memorials are being constructed around the world. One of the places that saw many memorials and candlelight vigils was Pier A in Hoboken, New Jersey. There was also a memorial service on March 11, 2002, at dusk on Pier A when the Tribute in Light first turned on, marking the half-year anniversary of the terrorist attack. A permanent September 11 memorial for Hoboken, called Hoboken Island, was chosen in September 2004. Soon after the attacks, temporary memorials were set up in New York and elsewhere. On October 4, Reverend Brian Jordan, a Franciscan priest, blessed the World Trade Center cross, two broken beams at the crash site which had formed a cross, and then had been welded together by iron-workers. On October 13, the North Charleston Coliseum raised a special banner featuring the retired number of Mark Bavis, who was on United Airlines Flight 175. Bavis had played for the ECHL's South Carolina Stingrays, and his retired number hangs in a special corner, independently from the Stingrays' retired numbers (#14, #24) and awards banners (1997 and 2001 Kelly Cup Championships), with the years he played for the team (1994–96), the date of his death (September 11, 2001), and an American flag. Also on October 13, The September 11 Photo Project was founded. The Project was a not-for-profit community based photo exhibit in response to the September 11 attacks and their aftermath. It toured seven cities over two years, collected photographs from more than 700 participants, and had over 300,000 visitors over its run. The Project provided a venue for the display of photographs accompanied by captions by anyone who wished to participate. The exhibit aimed to preserve a record of the spontaneous outdoor shrines that were being swept away by rain or wind or collected by the city for historical preservation. The Project was also made into a book titled "The September 11 Photo Project" in May 2002. It has sold over 60,000 copies to date. On March 11, 2002, the damaged sculpture The Sphere, formerly displayed in the World Trade Center, was dedicated by the city as a temporary memorial in Battery Park City. According to Radio Farda's website, when the attacks' news was released, some Iranian citizens gathered in front of the Embassy of Switzerland in Tehran, which serves as the protecting power of the United States in Iran (US interests protecting office in Iran), to express their sympathy and some of them lit candles as a symbol of mourning. This piece of news at Radio Farda's website also states that in 2011, on the anniversary of the attacks, United States Department of State, published a post at its blog, in which the Department thanked Iranian people for their sympathy and stated that they would never forget Iranian people's kindness on those harsh days. After the attacks, both the President and the Supreme Leader of Iran condemned the attacks. BBC and Time magazine published reports on holding candlelit vigils for the victims by Iranian citizens at their websites. Memorial at Cove Island Park in Stamford Connecticut. Memorial at Arlington National Cemetery for victims of the September 11, 2001, terrorist attack on the Pentagon. Sussex County September 11th Memorial, located on the grounds of Sussex County Community College in Newton, New Jersey, featuring a steel i-beam from the World Trade Center. Los Angeles Fire Department Academy has a memorial at the front entrance of its complex. It is an upright trident steel from the WTC. Honolulu September 11 Memorial. Dedicated November 11, 2001. A monument bearing an eternal flame (placed on top) and a Twin Towers likeness (etched in front) located outside Honolulu Hale (Honolulu Municipal Building) in Downtown Honolulu, Hawaii. John F. Kennedy Space Center 343 first responder victims memorial, Cape Canaveral, Florida. 9/11 Memorial, Naperville, Illinois. Located on the City's Riverwalk between the DuPage River and the City's Municipal Center, it includes 140 faces made by local school children to symbolize the victims of the attacks, a sculpture made from 100 pounds of debris from the Pentagon, granite from the region in Pennsylvania where United 93 crashed, a steel beam from the World Trade Center, and an Eternal Flame. College of DuPage 9/11 Memorial. Located in the lobby of the college's Homeland Security Education Center, it features several exhibits about the attacks and at the center is a steel beam from the World Trade Center. 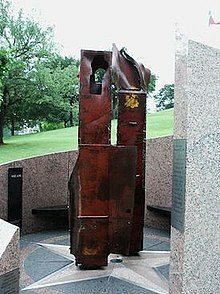 The Texas State Cemetery has a memorial to the September 11 victims. It is composed to symbolize the damaged Twin Towers, made with two twisted iron girders that had been part of the WTC and salvaged from the Ground Zero wreckage. The Crazy Horse Memorial, South Dakota, has a 9/11 memorial dedicated to the victims and first responders of the attacks. It is located at the entrance of the Crazy Horse Tourist Center. The city of Coral Springs, Florida, has its own memorial dedicated to the victims of the attacks. It is located outside the Northwest Regional Library, the city's only public library. The Garden of Reflection 9-11 Memorial is located in Memorial Park in Lower Makefield Township, Pennsylvania. Designed by Yardley architect Liuba Lashchyk, it is intended to symbolize light that follows darkness. Memoria E Luce, The Memoria e Luce is a memorial located in Padua, Italy. A twisted steel beam salvaged from the wreckage of the World Trade Center, which was donated by the United States to the Veneto Region and in turn to the City of Padua, was used to realize the design of an open and luminous book. Parco 11 Settembre 2001, a large public park in Bologna, Italy. "A Tribute to Firefighters" in The Firefighters' Reserve in Christchurch, New Zealand, was unveiled on October 26, 2002, as a memorial to the firefighters lost in the 9/11 attacks, as well as to firefighters worldwide who have died in the line of duty, at the first World Firefighters Games held after the attacks. 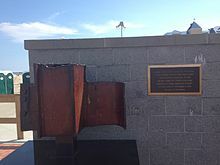 The sculpture, created by Christchurch artist Graham Bennett, consists of five steel girders from the World Trade Centre, gifted by the City of New York to the City of Christchurch for the purpose of this memorial. Colts Neck, New Jersey, which lost five members of their community, commissioned sculptor Jim Gary, a lifetime resident, to create a memorial garden featuring his central sculpture of brass, copper, and stained glass—where each victim is represented by a colorful butterfly among plants in a water garden. The contemplative garden was dedicated at the municipal center of Colts Neck on November 10, 2002. Recovering Equilibrium, at Los Angeles International Airport's Theme Building, unveiled on September 9, 2003, and designed by BJ Krivanek and Joel Breaux. Three of the four hijacked planes were originally bound for Los Angeles. The September 11 Memorial Garden in Grosvenor Square, London, United Kingdom, was opened on September 11, 2003, by the Princess Royal and the then-US Ambassador to the UK, William Farish. The central plaque in the garden is dedicated to the 67 Britons who were killed in the attacks and is surrounded by an oak pergola and pavilion which bears a quote from Queen Elizabeth II: "Grief is the price we pay for love". The garden has become the site for official commemorations of 9/11 in the UK. In July 2004, a Boston memorial to the 206 citizens of Massachusetts that died on September 11, 2001, was dedicated at the Arlington & Newbury St. entrance to the Boston Public Garden. The Rising, dedicated in Westchester County, New York, on September 11, 2006, in memory of the residents of that county killed during the 9-11 attacks. The Air Line Pilots Association constructed the 9/11 Remembrance Garden at its Herndon, Virginia, campus, which was dedicated on Sept. 11, 2006. The area includes a 10-ton stone from a western Pennsylvania quarry, split to represent the break that the terrorist attacks created in the airline industry. Two sections of steel I-beams from the World Trade Centers and a piece of the Pentagon’s outer wall also adorn the garden. On September 11, 2006, Ocean City, Maryland, erected the Ocean City Firefighter's Memorial to honor local firefighters as well as firefighters who died in the September 11 attacks. In addition to a statue of a firefighter, the monument incorporates a piece of steel beam from one of the towers destroyed at the World Trade Center. The FDNY memorial wall, a 56-foot-long (17 m) bronze wall of cast bas-relief bronze that honors the 343 firefighters who gave their lives in service to the public during the attacks. Commissioned by FDNY and unveiled in 2006 as a memorial to the fallen firefighters, it lists all of the fallen firefighters names, and is installed in the west wall of Engine Company 10 – Ladder Company 10 on Greenwich Street between Albany Street and Liberty Street, just across from Ground Zero. In Union City, New Jersey, which lost four of its residents during the attacks, the first 9/11 memorial was a sculpture placed in Doric Park, in whose courtyard citizens gathered on September 11, 2001 to view the attacks' aftereffects. On September 11, 2007, the city dedicated its Liberty Plaza to commemorate the event. The Plaza, which serves as a transit hub through which commuters pass on their way to and from Manhattan, includes two memorial markers. In subsequent years, citizens of neighboring towns have been honored at Liberty Plaza, including North Bergen resident David Lemagne, a Port Authority police officer who grew up in Union City, and perished during the attacks. Doric Park was later rebuilt as Firefighters Memorial Park, which opened in August 2009. A new memorial to local firefighters who gave their lives in the line of duty now stands in the entrance to the park's entrance, whose popularity has attracted visitors from Manhattan and Staten Island. On November 12, 2009, a 9/11 Living Memorial monument was dedicated in Israel, in Jerusalem's Arazim Park. Designed by Israeli artist Eliezer Weishoff, the 30-foot high bronze sculpture is composed of a waving American flag transformed into a memorial flame, which rests upon a base of gray granite, part of which is from the original Twin Towers. The sculpture is surrounded by a circular, crater-like plaza and reflection area tiled in stone. It is currently the only monument outside of the United States which lists the names of the nearly 3,000 victims who lost their lives in the 9/11 attacks. U.S. Ambassador to Israel James Cunningham, Air Attache Colonel Richard Burgess and U.S. Congressman Erik Paulsen led a U.S. delegation attending the ceremony dedicating the monument. They were joined by Israeli Cabinet ministers, former Israeli Prime-Minister Ehud Olmert, Israel Fire and Rescue Services Commissioner, Knesset members and families of the victims. In September 2008, a $3.5 million 9/11 memorial in the form of a glass cube was dedicated at Logan International Airport in Boston. The two jets that destroyed the World Trade Center had departed from Logan, and the memorial commemorates the 147 innocent victims aboard those flights. On September 11, 2009, the Defense Intelligence Agency dedicated a permanent memorial to the seven DIA officers who died on 9/11 while working at the Pentagon. The memorial is part of the Defense Intelligence Analysis Center on Bolling Air Force Base in Washington, DC, the largest of DIA's facilities. On May 31, 2010, during a Memorial Day ceremony, a nine-foot steel construction beam from the World Trade Center, was unveiled with the description "WTC 9 11 01" engraved on it. This beam stands in front of the Combined Joint Task Force Headquarters at Bagram Airfield, Afghanistan. On July 6, 2010, the Queen Elizabeth II September 11th Garden in Hanover Square, downtown Manhattan was officially opened by Queen Elizabeth II. It commemorates the 67 British victims of the attacks. 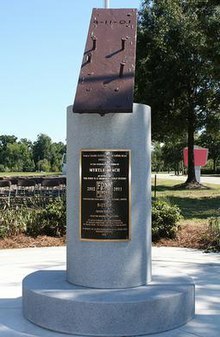 In September 2011, the Firefighters from Clyde, North Carolina, unveiled a monument dedicated to the victims of the attacks. It is composed of sections of steel from the World Trade Center, with fencework designed to look like the lobbies in 1 and 2 WTC. It is located in front of the Clyde fire department. Empty Sky, the official New Jersey memorial to 9/11 victims, dedicated on September 11, 2011, in Liberty State Park, New Jersey. On September 11, 2011, the State of Maryland unveiled the 9/11 Memorial of Maryland at Baltimore's World Trade Center. 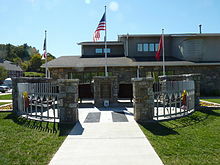 On September 11, 2011, the King of Prussia Volunteer Fire Company dedicated the King of Prussia Volunteer Fire Company 9/11 Memorial in King of Prussia, Pennsylvania. The memorial consists of two steel beams recovered from Ground Zero at the World Trade Center in New York City. On September 11, 2011, the City of Kennewick, Washington dedicated a memorial at the Southridge Sports and Events Complex that includes a section of the steel beam from the World Trade Center. On September 11, 2014, the City of Ybor, Florida unveiled a permanent memorial including a group of stainless steel figures and actual 9/11 debris. On September 11, 2015, a small memorial was unveiled at Edmonds, Washington Fire Station 17 as an expansion of the existing Firefighters Memorial Park. Huntington Beach 9/11 Memorial, Huntington Beach, California – A design plan was selected and the Memorial was opened to the public on September 11, 2016. The Memorial was built outside the Huntington Beach City Hall building and was dedicated on September 11, 2013. The Memorial design features two stainless steel towers, incorporating two girders from the World Trade Center provided by the Port Authority of New York and New Jersey. The words "We Will Never Forget" is etched along the base of the memorial. Funding was obtained through fundraising events and donations from private citizens. In September 2015, the Plano Firefighters Association created a World Trade Center and Ground Zero memorial at their office in Downtown Plano, Texas. It features a 6,600-pound piece of debris, given by the Port Authority of New York and New Jersey. In 2015 the two intact Port Authority Trans-Hudson cars saved from the WTC station were donated, one each to the Trolley Museum of New York and the Shore Line Trolley Museum. These cars were saved by the Port Authority of New York and New Jersey originally for use by the National September 11 Memorial & Museum but it was decided to make these cars available to other museums instead. The New Britain Museum of American Art commissioned painter Graydon Parrish to create the allegorical painting The Cycle of Terror and Tragedy in memory of New Britain native Scott O'Brien, who was killed in the attacks. The LeRoy W. Homer Jr. Foundation, established in memory of United 93 First Officer LeRoy Homer by his widow Melodie Homer. The Foundation awards up to three scholarships annually from applicants ages 16 – 23 residing within the United States as citizens or resident aliens. The scholarship program is funded through private donations, corporate contributions, and grant requests. The Foundation also promotes awareness of aviation as a career choice, with a focus on providing information to women and minorities who are underrepresented in the US pilot population. The US Navy named three ships—New York, Arlington, and Somerset,—in commemoration of the locations where the planes crashed during the attacks: New York State; Arlington, Virginia; and Somerset County, Pennsylvania. MTA bus 2185, which was heavily damaged in the collapse of the World Trade Center was restored and repainted with a special American flag scheme on its sides and rear. At the end of August in 2011, community leaders and a local crane company in Kennewick, WA helped erect a 6,000 pound steel beam from one of the twin towers in the center of a local high school´s sports complex. Thursday, September 20, the New York Philharmonic performed a memorial concert of Brahms' Ein Deutsches Requiem in Avery Fisher Hall. The concert was led off by the national anthem, and on the stage was a flag which appeared on stage during all Philharmonic World War II concerts. All proceeds went to disaster relief. At the request of the Philharmonic director, all applause was held, and the audience filed out in silence. Friday, September 21, America: A Tribute to Heroes: A two-hour live telethon entitled America: A Tribute to Heroes, with musical performances and spoken tributes by top American performers, was simultaneously broadcast on nearly every single network. Celebrities such as Al Pacino, George Clooney and Jack Nicholson manned the phones. Free Brooklyn Philharmonic concert conducted by Robert Spano at the Brooklyn Academy of Music with music from American composers, including George Gershwin, Leonard Bernstein, and Aaron Copland. The concert was rebroadcast on WNYC at 8 p.m.
Monday, October 8 and 15: Haircut for Life. Roberto Novo and his stylists cut hair to benefit WTC victims at the Roberto Novo Salon, 192 Eighth Avenue. Tuesday, October 9: Benefit for WTC Disaster Fund: Celebration of John Lennon's BirthdayThe East Village Antifolk scene play John Lennon's and their own songs to raise money. Performances from The Voyces, Joie DBG, Amos, Bionic Finger, Laura Fay, Barry Bliss, Tony Hightower, Linda Draper, Pat Cisarano, Lach, Testosterone Kills, Kenny Davidsen, Jude Kastle, Bree Sharp, Erica Smith, Fenton Lawless, Grey Revell, at the Sidewalk Cafe, 94 Ave. A. Volunteers for America, a benefit concert held on October 20, in Atlanta Georgia and October 21 at the Smirnoff Music Center in Dallas, Texas. The concerts were held in tribute to the victims of the September 11, 2001 attacks. Styx band members, Tommy Shaw, James Young along with others put the benefit concert together in a short period of time. The Concert was in Atlanta Georgia October 20 and moved overnight to Dallas, Texas for the October 21 show. Proceeds from the concerts went to Families of Fireman killed in the 9-11 Terror attacks. The Raoul Wallenberg Award was given to New York City in 2001 "For all of its citizens who searched for the missing, cared for the injured, gave comfort to loved ones of the missing or lost, and provided sustenance and encouragement to those who searched through the rubble at Ground Zero." On February 3, 2002, during the Halftime Show of Super Bowl XXXVI, rock group U2 performed Where the Streets Have No Name, while the names of the victims were projected onto banners. Bono opened his jacket to reveal a U.S. flag pattern sewn in the inside lining. At the opening ceremony of the 2002 Winter Olympics in Salt Lake City on February 8, a tattered American flag recovered from the World Trade Center site was carried into the stadium by American athletes, members of the Port Authority police, and members of the New York City police and fire departments. On February 23, 2003, the 45th Annual Grammy Awards were held at Madison Square Garden and paid tribute to those who died during the 9/11 attacks, to whom the ceremony was dedicated. Ceremony host Bruce Springsteen performed "The Rising" at the Awards. American country singer Darryl Worley paid tribute to the people with his 2003 single, "Have You Forgotten?" from the album of the same name. Newark International Airport was renamed "Newark Liberty International Airport". On September 11, 2002, representatives from over 90 countries came to Battery Park City as New York City Mayor Michael Bloomberg lit an eternal flame to mark the first anniversary of the attacks. Leading the dignitaries were Canadian Prime Minister Jean Chrétien, U.N. Secretary General Kofi Annan, Bloomberg, and Secretary of State Colin Powell. The same day, the Victims of Terrorist Attack on the Pentagon Memorial was dedicated at Arlington National Cemetery near the Pentagon. The memorial is dedicated to the five individuals at the Pentagon whose remains were never found, and the partial remains of another 25 victims are buried beneath the memorial. The names of the 184 victims of the Pentagon attack are inscribed on the memorial's side. Many organizations held memorial services and events for the 10th anniversary of the attacks. The official New York City observance of the 10th anniversary of September 11 took place at the World Trade Center site at 8:40am – 12:30pm Sunday, September 11, 2011. Zuccotti Park, Liberty Street between Broadway and Church Streets. Four moments of silence were observed to commemorate the times when each plane hit and each tower fell, starting at 8:46 a.m.
At sunset, the Tribute in Light dual search light lit the skies above New York City for the night of 9/11/11. Liquid Church held Memorial worship services in three cities in New Jersey: Montclair, Morristown, and New Brunswick on 9/11/11 at 9:30am and 11:30am in each city. The church also commissioned and recorded a tribute song written by Dave Pettigrew & Frank Di Minno called, "There is Hope." 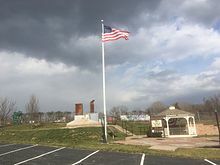 In Radcliff Kentucky at the Kentucky Veteran's Cemetery Central, a committee of local citizens worked on a memorial effort taking only 8 weeks from the time of receipt of a piece of steel from the World Trade Center to the Tenth Anniversary remembrance ceremony. In that time they developed a concept design, found companies willing to donate time, labor, technical expertise, and material, and began a fund raising effort which allowed a memorial to be erected solely on private funding. This memorial completed phase I in these 8 weeks and now enters phase II. Hundreds of citizens assembled during the remembrance ceremony held for the Tenth Anniversary on Sunday, September 11. Every year on September 11 a commemoration is held at the National September 11 Memorial. Family members read the names of victims of the attacks, as well as victims of the 1993 World Trade Center truck bombing. Elected officials and other dignitaries attend, but since the 2012 event they have not given speeches. The Tribute in Light project consists of 88 searchlights placed next to the site of the World Trade Center created two vertical columns of light. 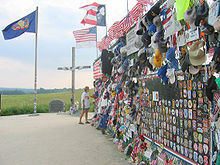 The tribute began in 2001, and is now made every year on September 11. The National 9/11 Flag was made from a tattered remains of a 30-foot (9.1 m) American flag found by recovery workers in the early morning of September 12, 2001. It was hanging precariously from some scaffolding at a construction site next to Ground Zero. Because of safety reasons the flag could not be taken down until late October 2001. Charlie Vitchers, a construction superintendent for the Ground Zero cleanup effort, had a crew recover the flag. It was placed in storage for seven years. The flag has made a number appearances across the country including a Boston Red Sox Game, a New York Giants Home Opener, and the USS New York Commissioning Ceremony. It also appeared on the CBS Evening News and on ABC World News Tonight "Persons of the Week." The flag began a national tour on Flag day, which was on June 14, 2009. It will visit all 50 states where service heroes, veterans, and other honorees will each add stitching and material from other retired American flags in order to restore the original 13 stripes of the flag. The flag will have a permanent home at the National September 11 Memorial and Museum. The 9-11 Remembrance Flag was created to be a permanent reminder of the thousands of people lost in the September 11 attacks. The purpose of keeping the memories of September 11 alive is not to be forever mourning, but for "learning from the circumstances and making every effort to prevent similar tragedies in our future." The flag is also meant to be a reminder of how the people of this country came together to help each other after the attacks. The red background of the flag represents the blood shed by Americans for their country. The stars represent the lost airplanes and their passengers. The blue rectangles stand for the twin towers and the white pentagon represents the Pentagon building. The blue circle symbolizes the unity of this country after the attacks. The 9/11 National Remembrance Flag was designed by Stephan and Joanne Galvin soon after September 11, 2001. They wanted to do something to help and were inspired by a neighbor's POW/MIA flag. They wanted to sell the flag so people would remember the September 11 attacks and in order to raise money for relief efforts. The blue represents the colors of the state flags that were involved in the attacks. The black represents sorrow for innocent lives lost. The four stars stand for the four planes that crashed and the lives lost, both in the crash and in the rescue efforts, as well as the survivors. The blue star is a representation of American Airlines Flight 77 and the Pentagon. The two white stars represent American Airlines Flight 11 and United Airlines flight 175, as well as the twin towers. The red star stands for United Flight 93 that crashed in Shanksville, Pennsylvania and all those who sacrifice their lives to protect the innocent. The colors of the stars represent the American flag. The four stars are touching each other and the blue parts of the flag in order to symbolize the unity of the people of the United States. The National Flag of Honor and the National Flag of Heroes were created by John Michelotti for three main reasons: (1)"To immortalize the individual victims that were killed in the terrorist attacks of September 11, 2001." (2)"To give comfort to the families left behind knowing that their loved one will be forever honored and remembered." (2)"To create an enduring symbol, recognized by the world, of the human sacrifice that occurred on September 11, 2001." The Flag of Honor and the Flag of Heroes are based on the American flag. They both have the names of all the innocent people who were killed in the September 11 attacks printed on the red and white stripes of the American Flag. Both flags have a white space across the bottom with the name of the flag and a description printed in black. The Flag of Honor reads: "This flag contains the names of those killed in the terrorist attacks of September 11. Now and forever it will represent their immortality. We shall never forget them" The Flag of Heroes reads: " This flag contains the names of the emergency service personnel who gave their lives to save others in the terrorist attacks of September 11. Now and forever it will represent their immortality. We shall never forget them." The Flag of Honor and the Flag of Heroes were featured at the NYC 9/11 Memorial Field 5th Anniversary in Manhattan's Inwood Hill Park September 8–12, 2006. There 3,000 flags which represented those who died in the September 11 attacks. The flags were also featured on the msnbc Today Show and on ABC 13 News, Norfolk, VA. The Remembrance Flag has a white background with large, black Roman numerals IX/XI in the center and four black stars across the top. The IX/XI are the Roman numerals for 9/11. The four stars represent World Trade Center North, World Trade Center South, the Pentagon, and Shanksville, PA. The 10th Anniversary September 11 Memorial Flag was designed by Carrot-Top Industries, a privately owned company in Hillsborough, NC. The exclusive 9/11 memorial flag was designed with the two World Trade Towers set inside a pentagon decorated with a ribbon to commemorate all of the Americans that lost their lives on September 11, 2001. On September 11, 2007, a virtual reality World Trade Center Memorial will be presented to the people of the world. The location is in Second Life, on the island we have named after the original design: Celestial Requiem NYC. We have built this memorial because, to be blunt, the world needed it done years ago, and the two years longer to await the completion of the Reflected Absence memorial in New York city (by Michael Arad and Peter Walker) was in our opinion two years too long. World Trade Center Memorial (SecondLife) is focused on the victims of 9/11, reminiscent of the Memorial Wall of the Vietnam Veterans Memorial. Palm Harbor 9/11 Memorial, Palm Harbor, Florida – This memorial broke ground on March 30, 2012[update]. It will be designed around a 150-pound piece of World Trade Center steel provided (and still owned) by the Port Authority of New York and New Jersey. Memorial sign of the New York City Fire Dept. Memorial at Liberty Plaza in Union City, New Jersey, which lost four citizens in the attacks. ^ "Memorial Plaque at Battery Park, beneath "The Sphere" Sculpture, now a Temporary Memorial". photo. Flickr. May 11, 2007. Retrieved March 24, 2010. ^ Pelland, Dave. "9/11 Memorial, Danbury". CTMonuments.net. Retrieved February 6, 2018. ^ Work Starts on 9-11 Memorial ToledoBlade.com. Retrieved 28 March 2016. ^ "Beverly Hills 9/11 Memorial Garden". Retrieved May 28, 2012. ^ "Seaford 9/11 Memorial". Retrieved May 28, 2012. ^ Clay, Joanna (September 9, 2011). "Remembering always". Laguna Beach Coastline Pilot. ^ "September 11 Memorial Park Committee, Inc." Westfield Today. Retrieved May 28, 2012. ^ "Commander Dan Shanower - Sept. 11 Memorial". Retrieved August 27, 2015. ^ "Monuments". Texas State Cemetery. accessed September 15, 2011. ^ "Loved ones remember those lost on 9-11". tribunedigital-sunsentinel. ^ "September 11 Memorial Plaza - Cal Expo". Retrieved September 14, 2016. ^ "Hermosa Beach 9/11 Memorial". Foursquare. ^ "9/11 Memorial in Manhattan Beach California". CNN iReport. ^ "10th Year Commemoration Information". The Garden of Reflection 9/11 Memorial, accessed September 15, 2011. ^ "Art Program – LAX 9/11 Memorial". Archived from the original on September 11, 2011. Retrieved September 28, 2012. ^ "Garden memorial to 9/11 victims". BBC News. September 11, 2003. Retrieved February 26, 2016. ^ "David Cameron and Prince Charles join relatives of British 9/11 victims for a touching memorial service by the American Embassy in London". Daily Mail. September 12, 2011. Retrieved February 26, 2016. ^ "The Rising: Westchester County's September 11th Memorial". WestchesterGov.com. accessed September 15, 2011. ^ Perkinson, John. "A Day of Remembrance". ALPA.org. ^ The FDNY memorial wall "The Environment". The FDNY Memorial Wall. accessed September 15, 2011. ^ "The Design". The FDNY Memorial Wall. accessed September 15, 2011. ^ "Visitor Resources". National September 11 Memorial & Museum. accessed September 15, 2011. ^ Lucio Fernandez and Gerard Karabin. Union City in Pictures. Book Press NY. 2010. Pages 24 and 25. 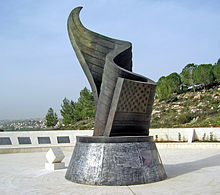 ^ "9/11 monument dedicated in Jerusalem". Jewish Telegraph Agency. November 12, 2009. Archived from the original on December 17, 2009. Retrieved March 8, 2010. ^ deLuzuriaga, Tania (September 9, 2008). "Memorial to be unveiled at Logan to those lost on 9/11 flights". Boston Globe. Boston. Retrieved February 11, 2012. ^ Defense Intelligence Agency Memorial Archived May 14, 2011, at the Wayback Machine. accessed September 7, 2011. ^ McConville, James. "Remembering 9/11 in Afghanistan". Army.mil. United States Army. Retrieved September 11, 2017. ^ Kleinfield, N. R. (July 6, 2010). "Elizabeth II Pays Her Respects at Ground Zero". New York Times. Retrieved May 11, 2011. ^ "9/11 Memorial of Maryland". ^ "9/11 Memorial". King of Prussia Volunteer Fire Company. Retrieved February 1, 2017. ^ "King of Prussia 9/11 Memorial". VisitPA.com. Retrieved February 1, 2017. ^ Trumbo, John (September 8, 2011). "Kennewick to unveil memorial of 9/11 attacks on Sunday". Retrieved September 23, 2018. ^ King, Rikki (September 11, 2015). "9/11 is remembered in Edmonds at new memorial park". The Everett Herald. Archived from the original on September 12, 2015. Retrieved September 11, 2015. ^ "Hayward: 9/11 Memorial nears completion". eastbaytimes.com. May 19, 2016. ^ Katapodis, Jim. "Huntington Beach 9/11 Memorial". Archived from the original on June 1, 2013. ^ "World Trade Center beam displayed in eastern Plano". Star Local. Retrieved February 2, 2017. ^ "PATH train cars that survived 9/11 on display in CT, NY trolley museums". abc7ny.com. December 4, 2015. ^ "9/11 surviving PATH Subway Car will arrive at SLTM – Thursday, August 6th 11:15 AM - The Shore Line Trolley Museum Operated by the Branford Electric Railway Association, 17 River Street, East Haven, CT, 06512". shorelinetrolley.org. ^ The LeRoy Homer Foundation. accessed September 7, 2011. ^ "Future USS Arlington Launched". Navy News Service. United States Navy. November 24, 2010. Retrieved November 28, 2010. ^ "MTA New York City Transit (Bus): MCI 102-DLW3SS / D4500' Archived April 2, 2012, at the Wayback Machine. The Bergen Network. accessed September 15, 2011. ^ Cass, Connie. "Cremated Remains of Pentagon Victims Are Laid to Rest at National Cemetery. Associated Press. September 13, 2002. ^ "9/11 Memorial Service". LiquidChurch. Archived from the original on January 4, 2012. Retrieved August 13, 2011. ^ "9/11 commemoration ceremony to limit access to World Trade Center area". Daily News. New York. ^ Oh, Inae (September 10, 2013). "12 Years Later". Huffington Post. ^ Chan, Sewell (September 11, 2007). "Will Tribute in Light Go Dark After '08?". New York Times. Retrieved May 26, 2010. ^ "September 11th Tribute Lights Up Again". NY1.com. Archived from the original on September 14, 2009. ^ Dunlap, David W. (September 10, 2010). "'Tribute in Light' Will Keep Shining, This Year and the Next". New York Times. Retrieved September 11, 2010. ^ Shapiro, Julie. "Patchwork Flag Symbolizing 9/11 Recovery Unfurled Over Ground Zero". DNAinfo.com. Archived from the original on April 26, 2011. Retrieved December 8, 2010. ^ "Flag Facts". The National 9/11 Flag. September 11, 2008. Retrieved December 8, 2010. ^ Andrew Beam (September 11, 2001). "All 50 states helping to repair 9/11 flag". Legislativegazette.com. Archived from the original on August 2, 2012. Retrieved December 8, 2010. ^ "FDNY – Powered by Chris A. Kenner & DAEMAG". NYC 911 Memorial Field. Retrieved December 8, 2010. ^ "allDAY – TODAY's Talk: Remembering 9/11, flags of honor and what makes a good friend?". Allday.msnbc.msn.com. Archived from the original on July 8, 2012. Retrieved December 8, 2010. ^ "Va. Beach couple raises money for Flight 93 national memorial | 13NEWS / WVEC.com | Raw | wvec.com | News for Hampton Roads, Virginia". wvec.com. Archived from the original on September 21, 2011. Retrieved December 8, 2010. ^ "Celestial Requiem NYC, 11, 120, 21". ^ "Announcement of Celestial Requiem NYC". ^ "World Trade Center Memorial, World Trade Center 181, 76, 26". 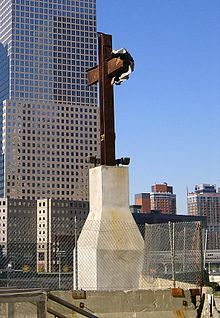 Wikimedia Commons has media related to 9/11 monuments and memorials. 9/11 Living Memorial Plaza dedication ceremony – Video and information about the 9/11 Living Memorial Plaza dedication ceremony in Jerusalem, on November 12, 2009. This page was last edited on 18 March 2019, at 18:17 (UTC).